Bob Woodward. 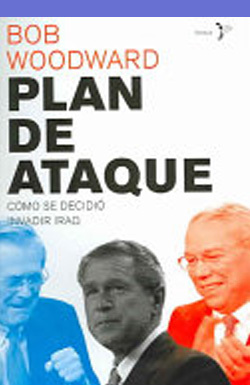 Plan de ataque: cómo se decidió invadir Iraq, Barcelona: Bronce, 2004, 517 pages. Translated by Marta Pino Moreno. ISBN: 9788484531517. Spanish translation of this title: Bob Woodward. Plan of Attack: The Definitive Account of the Decision to Invade Iraq. Simon & Schuster, 2004. Published in Spanish by Ediciones del Bronce.